ABBA ABBA is a great read from the exceptional Anthony Burgess, unknown sides to whom are on full show here. Translating Style by Tim Parks for my work in Translation Studies. Bracciano, in the countryside outside Rome, where Burgess lived; Brussels, where the linguist now lives who helped Burgess with Belli’s Roman dialect; and Austin, Texas, where many of Burgess’s papers now reside at the Harry Ransom Center. Burgess was from Manchester and read English at Manchester University. It seems only proper that MUP should publish his collected works in a fitting scholarly edition. I’m finishing a monograph on Belli, and writing another on Burgess’s time in Italy. If you could go back and give yourself one piece of advice when starting out on this project, what would it be? Graham Greene’s The End of the Affair, because it had a profound effect on me as an adolescent. Burgess preferred The Power and the Glory and The Heart of the Matter. Poetry, and fiction, particularly translated fiction. John Keats, Giuseppe Gioachino Belli, and Anthony Burgess. Burgess stages something close to this in Part One of ABBA ABBA. Paul Howard is a Senior Teaching Associate in Italian in the School of Modern Languages at the University of Bristol. 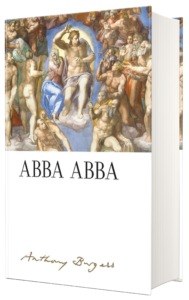 ABBA ABBA is available to pre-order now. Learn more about The Irwell Edition of the Works of Anthony Burgess by clicking on the banner below.